Reston, VA – Network Depot utilizes the latest knowledge, innovations, and thought leadership from around the business IT support industry to best serve their clients throughout the DC metro area. In order to stay ahead of the curve and serve their clients at the highest possible level, Network Depot representatives are frequently attending industry-leading events and conferences to familiarize themselves with the latest technologies, processes, and methodologies. 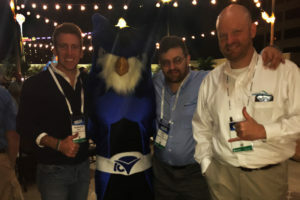 Recently, three members of the Network Depot leadership team – Rich Forsen (CEO/Founder), Paul Barnett (COO), and Chris Boyd (Director, Managed Services Sales) – attended the IT Nation conference in Orlando, Florida. IT Nation is an annual event organized by Connectwise, a provider of services and solutions for the IT industry, and is billed as the leading event for the technology solution provider industry with more than 2,500 companies and 4,000 individuals participating in 2016. IT Nation is a go-to source of insight into the latest trends and tools for providers of business IT support.The Network Depot team has been attending this event over the past decade with the constant goal of improving their knowledge and processes to provide the best support for their clients. The team praised the event as an invaluable opportunity to learn about the latest trends in the IT solutions industry in classroom and lab sessions, discuss and analyze problems with peers from leading firms, and hear from thought leaders in the tech industry. The unique experience at IT Nation will help the company improve upon their top-tier business IT support services. Network Depot works with small to mid-size businesses to provide them with IT support, managed services, network and server management, and IT consulting. Their experience in IT managed services and IT support has allowed them to build and develop the infrastructure to prevent issues before they occur, avoiding expensive downtime and allowing businesses to focus on their bottom line. Network Depot is located at 12040 South Lakes Drive #202, Reston VA, 20191. For more information about Network Depot and the Business IT Support Services they offer please contact them at 703-910-3960 or go to their website at https://www.networkdepot.com/contact-us.